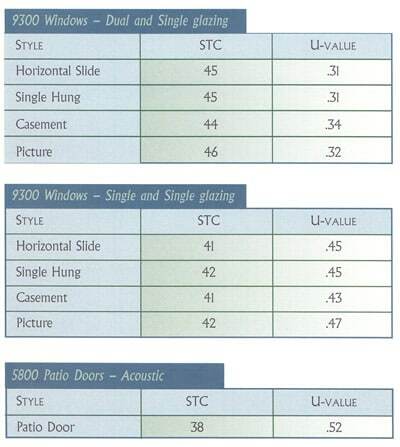 Acoustic Vinyl Windows & Doors Performance Matrix Yellow Dog Windows, Inc.
1. Sound transmission class determined using ASTM-413. 2. Tested in accordance to AAMA/NWWDA 101/1.S.2-97 specification. 4. Forced entry resistance tested in accordance to CAWM 301-90 for windows and CAWM 300-89 for doors. 5. U-value determined in accordance to NFRC 100. 6. Solar heat gain coefficient certified in accordance to NFRC-200. 7. Visible light transmission certified in accordance to NFRC-200. 8. CRF determined in accordance to AAMA 1503. 9. Tested in accordance to ASTM-E283. All contents Copyright ©2018 YD Windows, Inc.